The little australian shepherd Buddy dreams about being a wild, strong and natural wolf. He tries hard to learn everything a wolf do and more, but he also needs the right grain free food as wolves need. 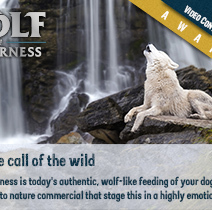 Will he manage to convince his owner of the new quality food for his wolf career?